Blizzard have unveiled their six phase plans for introduce PVP content into World of Warcraft Classic when it releases in summer this year. Bringing World of Warcraft Classic gets fans of the 15 year franchise closer to the original vanilla days, before the numerous expansions and updates. Safe to say, it will be a very different experience from the current release. Blizzard have now shared their plans for PVP content on their forum, releasing six different stages. World of Warcraft Classic will start with no structured PVP system much like it did when WoW was originally released. This means Classic will have open-world PVP, meaning you can hunt NPCs or the opposite faction without reward or deterrent. The second phase will introduce Honorable Kills, Dishonourable Kills and PVP Rank Rewards which according to the Community Manager Bornakk it will require some “consistent dedication” if you want to rank up with the Honor System. The third phase will bring Battlegrounds for more competition based PVP in Alterac Valley and Warsong Gulch which based on Patch 1.12 Drums of War. Phrase four will bring the Arathi Basin Battleground as well as specific vendors but not all items will be available when these vendors get added, as they will be added later in phase 5. In the last phase, PVP objectives will be added in Silithus and Eastern Plaguelands, releasing at the same time as Naxxramus. While the phase introductions seem quite planned out, Blizzard are yet to give specific dates for each of these. It’s interesting see how Blizzard plans to introduce the roll out of content, as they are following similarly to how they first introduced them in the game first time round but also learning from the experience. World of Warcraft Classic is set to release sometime this summer and will require a World of Warcraft to play. 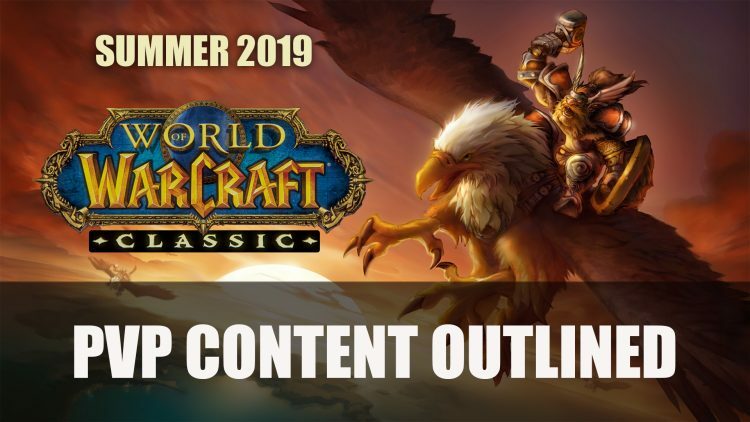 If you want more World of Warcraft content be sure to check out World Of Warcraft Classic Launches Summer 2019; WoW Subscribers Play Free and Battle For Azeroth Becomes The Fastest Selling World Of Warcraft Expansion.